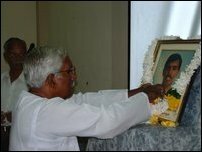 Mr.Nimalarajan was shot dead in his residence on 19th October 2000 by unknown gunmen suspected to be members of the para military EPDP. Mr.S.Kathirgamathamby, President of the North Sri Lanka Journalists Association presided. Mr.Vimal Saminathan, a Sinhala lecturer and a close associate of Mr.Nimalarajan garlanded the photograph of late journalist. 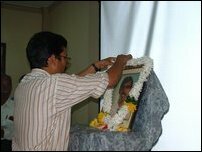 Professor A.Shanmugathas, Director of the Media Research and Training Centre lit the flame of remembrance followed by editors of Tamil dailies published in Jaffna, sources said. Chief Editors of Uthayan, Valmpuri, Yarl Thinakural Messrs M.V.Kaanamailnathan, N.Wijesuntheram and K.Vamadevan, Mr.N.Ramachchandran of Virakesari, Mr.N.Parameswaran of Daily Mirror and journalist Mr.V.Thavachchelvam recalled the services of Mr.Nimalarajan to journalism in their speeches.